Housekeeping: That’s right, but not that kind of housekeeping. What I am referring to is getting your mind, body and soul clean by re-organizing what is important to you and why. Start making priority lists and discard the rest. There’s nothing better than a good dusting to see what’s hiding underneath it all. Keep your mind fresh and clean by keeping your thoughts positive. Keep your body happy and healthy by exercising and getting rid of unwanted body fat! Keep your soul revitalized by being true to yourself and not pretending to be someone you’re not. Keep the fire burning by being authentic, not fake because fake fizzles out really fast. Hasta La Vista Baby: Say goodbye to narcissists and people who are not your true friends. These types of people drain you and don’t have time for you so why hold onto them? Respect yourself by knowing you are worthy and a joy to be around, it’s their loss if they can’t appreciate you. If someone seriously wants to be a part of your life, they will seriously make an effort to be in it. People who keep you hanging in silence for their own benefit need to be cut out immediately. Not only is this selfish and hurtful, they aren’t worth it and life is too short. Now you can start learning the words to #Alicia Keys song “This Girl Is on Fire! !” or any other song with the word #FIRE in it. Actions speak louder than words. Connection: Say hello to the people who excite you and bring joy into your life! People who make you laugh are definitely going to set your life on fire and fan your flames because not only are they fun to be around, laughter wakes up all the cells in your body, boosts your immune system and if done long enough, makes your face hurt in a good way. Forget social media and get out of your house and off your phone! Meet people face to face and start connecting with them on many different subjects. You will walk away feeling content and grateful for knowing them. Be kind to your friends and treat them right by making time for them. If there is someone you have always wanted to talk to and haven’t yet, now’s the time to find the courage and “Just do it” like #Nike says. Remember, this is an article on how to set your life on fire, not play it safe so get out there! New Hobby Anyone: Still trying to figure out how to use that epic camera you bought last year? It’s time to take it out of the box and start snapping some shots!!! Sign up for a photography class and make that commitment to learning something new outside your box! By taking a new class you might find new friends and connect with people you never knew existed. Whatever your hobby is, the point is to get started and try something NEW. Not your usual hobby because new is what starts the spark and the spark is what starts the fire! Dance: What’s your favourite tune? Whatever you love to listen to, get off the couch and turn up the music! When music is played louder than usual, it can actually light you up from the inside out and bring back those loving feelings and memories. Upbeat music causes this natural instinct to get your body moving and before you know it, you’re singing along and feeling great! There is no way you can feel depressed when singing and dancing so it’s great to rekindle with the oldies but goodies or with the latest and greatest hits. Remember high school? You get to choose the music so tear up the dance floor and light your fire! Be Adventurous: Still longing to climb Mount Kilimanjaro, run that marathon, bungee jump off that cliff or get that wild haircut you always wanted? If you are into that kind of risk taking then congratulations, you are living on the edge and your life is already on fire! For the rest of us, adventurous can mean other things like zip lining, travelling or public speaking. Yikes! When you do something new, it’s exciting and it can have several positive side effects like bragging rights to all your friends and posting pictures of yourself everywhere. You feel that sense of accomplishment for being courageous enough to do something outside your usual pattern of living and not procrastinating about it. You know what they say, life begins at the end of your comfort zone. Do what scares you! Spice It Up: Whether it’s an old flame your current flame or a new flame, this is a great way to ignite the fire within. Just pick one flame at a time! Life gets busy and we tend to ignore our love life more than we should. When was the last time you bought something spicy? All flames are precious so be kind, respectful and take care not to get burned or end up burning the one you care about. Whatever you do, don’t burn a bridge. 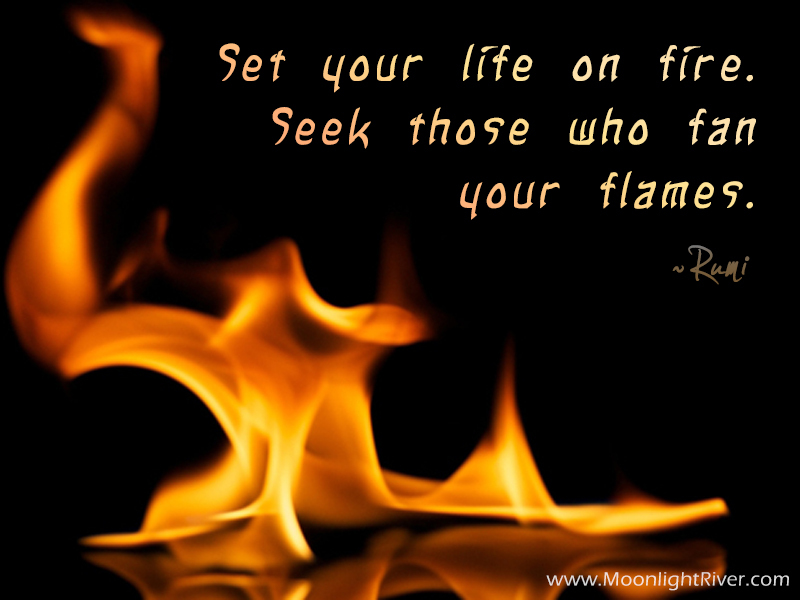 Try to keep the fire burning between you in order to keep things interesting and alive! Make a Career Move: Easier said than done I know. People tend to stay where they are because it’s safe. Life is not safe people. It’s about risk taking and being happy so if you have something in mind like a dream to work somewhere new or try something different, I am here to tell you that it’s possible. Maybe you are a secretary who is very artistic and would love to paint. Begin it. Maybe you’ve always dreamed of working in another country? That is a sure way to set your life on fire with culture differences and being exposed to new ways of doing your usual job. Start exploring what’s out there and talk to people who have already taken that leap through the ring of fire. Book a Vacation: When was the last time you went somewhere fun? Do you tend to go to the same place with the same people? Well, it’s time to kick things up a notch. Grab your closest friend and book that trip you’ve always wanted to do! At one point in your life, you have to hit Disney World. One of the craziest ways to set your life on fire is by riding the roller coasters like Aerosmith’s Rock ‘n’ Roller Coaster Ride. When you hop on, it takes off like a rocket at 57 miles an hour with the songs “Walk This Way” and “Dude Looks Like a Lady” blasting in your ears from the speakers in the headrest. If you don’t see your life flash before your eyes at that point… you must be dead. Follow me on #Twitter @fjj_juneau or like my Facebook page #Courage Coach. See you there!